Fighting against the dark side whether at home or in the office, this superbly designed TIE Fighter Posable Desk Lamp is the ally you need to get the job done. A brilliant desk top lamp in the design of a classic Star Wars TIE Fighter, the iconic spaceship can be positioned and posed over your work area to shine light down exactly where you need it. 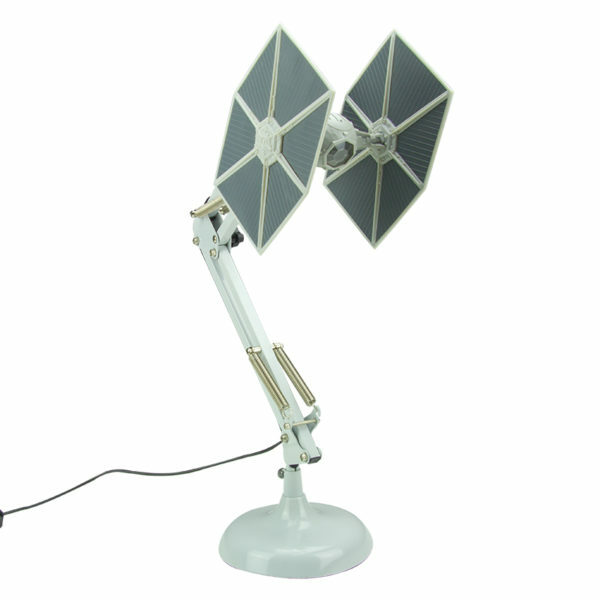 USB powered, the TIE Fighter Posable Lamp is approximately 60cm high when fully extended. Star Wars has been one of the most successful film franchises in cinema history since its original release in 1977, quickly becoming a defining moment in popular culture. The series has continued to win new generations of fans with each instalment, resulting in a global fan base of millions. From A New Hope and Return of the Jedi through The Phantom Menace and Attack of the Clones, right up to more recent successes such as The Force Awakens and The Last Jedi, Star Wars continues to reach new heights by introducing great new characters as well as focusing on old favourites. A great gift for fans of the epic movie franchise, the TIE Fighter Posable Lamp is an officially licensed Star Wars product.